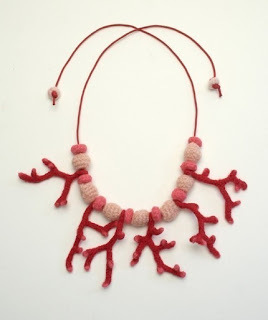 As promised, in this, the first month of the Crochet Coral Reef at the Hayward Gallery London, an interview with one of the main contributors, Helle Jorgensen from Australia. Helle's blog Gooseflesh and her etsy shop, beautifully represent her work and creativity. She travels tirelessly on behalf of the crochet reef, at the same time spreading her passionate belief in the survival of our environment coupled with her ability to communicate this in her work. I've loved reading Helle's interview, in fact all our interviewees have made me realise how wonderful the skill of crochet is for connecting to previous generations. So many were taught by older members of the family and have experience of it's influence in their growth and development. 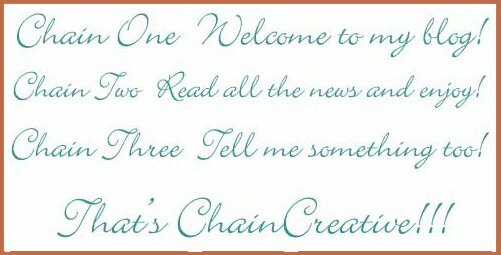 Helle's answers on her involvement with the crochet reef are very enlightening and act as a wonderful support to our visits to it in the next few weeks. If you are able to get to it do look out for her work - and enjoy. 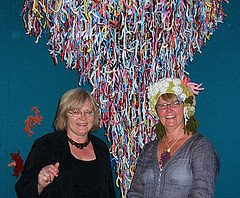 The pictures I've included are of Helle and Dr Daina Tomeschu with the Rubbish Vortex in the background, the Rockpool Collage at the Hayward seaweed crocheted from Marks and Spencers plastic bags and finally one of Helle's products in her etsy shop. Thank yo u again, Helle, for your help in this interview. It's been a real pleasure. I live on the Northern Beaches, Sydney, Australia. I was born in Denmark, migrated to Australia at the age of 13 years. Describe your various creative skills. I use a variety of creative skills to make my pieces, e.g. drawing, painting, printmaking, photography, sewing, embroidery, knitting and, of couse, crochet. When did you start to crochet and who taught you? My grandmother, Agnes Jorgensen, taught me to crochet as a child. Until about five years ago I hadn’t done a lot of crochet and have since taught myself the various techniques from books and the internet. What, in your opinion, is the best thing about crochet? -There’s only one stitch on the hook at a time. -It’s sculptural potential because of the ability and flexibility to make all sorts of different shapes. 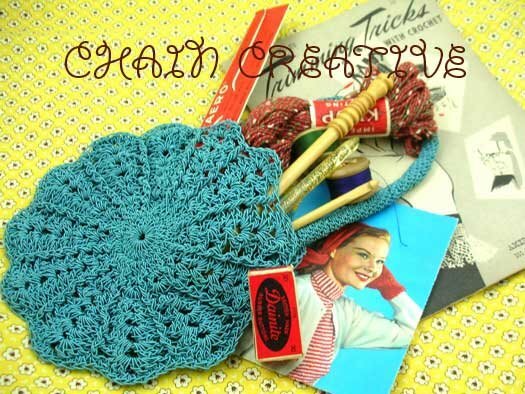 -I love that it’s a very old skill and that it connects us to generations of crocheters in the past. -It’s connection to science and mathematics. -The repetition and rhythm of crochet is akin to meditation. The name of the blog is interesting. What was the inspiration behind it? Gooseflesh was one of those words that just popped into my head. I came up with it as a teenager, whilst making things, and it’s stuck with me all this time. I’m not sure why. Unfortunately, it has no deep significance. I just love it’s sound and meaning. What influences your style and output? What are your inspirations? My fascination and love of the natural world is probably the major source of inspiration for my work. I have background in biology and horticulture. Nature’s complexity and interconnectedness continuously inspires me. I live very close to the beach and go swimming, surfing or walking on the beach most days. I have a huge collection of driftwood and sponges which I plan to incorporate into my work in the future. -Light and colour is also a continuous surprise and inspiration to me. -My Scandinavian roots have influenced my style and sense of design. -With experience I have come to realize that my work is an exploration of my identity. What does Hyperbolic crochet mean to you? Tell us about the Crochet Reef. I had been crocheting sea creatures for a while when I discovered Daina Tomeschu’s crocheted hyperbolic model. The overlapping of crochet and science/mathematics is fascinating and I have subsequently made a few hyperbolic based pieces. However, there are many other techniques, stitches and ideas I want to explore. 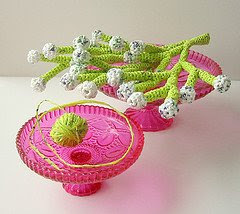 The hyperbolic model has brought crochet into the 21st century and inspired all sorts of people to take up crochet. (I’m assuming you mean the IFF’s Crochet Reef). 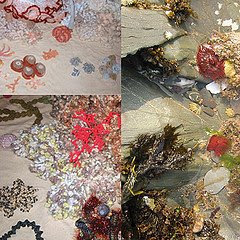 The IFF saw my crocheted plastic bag sea creatures on Flickr a couple of years ago and invited me to exhibit with the reefs. Since then I have been commissioned to make pieces for the reef (not hyperbolic), e.g. The Rubbish Vortex. It’s been very interesting to join a large group of people to make up a reef. I have thoroughly enjoyed making new friends from all over the world. Hopefully the crochet reefs will bring attention to the effects of climate change on the Great Barrier Reef and other reefs around the world. My technique of using plastic bag yarn to make crochet sea creatures has been adopted by the IFF. Which I see as a sign of validation of my work. I did not set out to make a political statement about the plight of the coral reefs but felt the message was inherently embedded in the medium in a subtle way. The response to using plastic bag yarn has been phenomenal and has re-vitalized the technique. What are the most important aspects of your work to you? Having the freedom to realize my ideas. Being true to myself. Being absorbed in the process and continuously learning new things. Using discarded and pre-loved materials pushes my boundaries. Which project or piece of work are you most proud of? The sea creatures crocheted from plastic bag yarn. Mainly because of the embedded ecological message. When are you most happy when you’re working? I’m most happy whilst working when I am able to totally loose myself in what I’m doing…… Peace, with no interruptions and the ability to bring my ideas to fruition. Thank you very much Berto. Nice name!!! Just letting you know........ it should be Daina Taimina, not Daina Tomeschu. Thanks again.